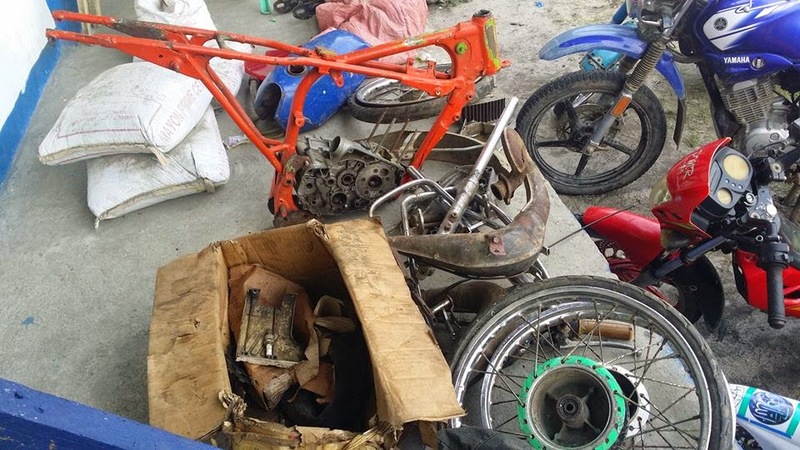 Police Recovered 18 Stolen Motorbikes in Sultan Kudarat w/ Photos - Exam News, Reviewer, Military Career, & Everything [MN] . .
Police authorities had recovered about 18 motorcycles of various model and disassembled or “chop-chop” part make from a stockyard in the safe house and hiding place of suspects Sapal Guimilon, Diego Guimilon and Suidong Guimilon in Sitio Tubuk, Barangay Ilian, Esperanza, Sultan Kudarat during the raid last Wednesday. In his report to Criminal Investigation and Detection Group chief Director Benjamen Magalong, Inspector Christian Garcia, CIDG Sultan Kudarat provincial head, said the trio were believed to be responsible in the shooting and killing of SPO4 Ruben Sabado of Sultan Kudarat police provincial office. Sabado was driving home on Sunday night on board a Honda XLR 200 motorbike when flagged down by two men riding tandem on a motorbike along a highway in Esperanza, Sultan Kudarat. Police Supt. Jemuel Siason, intelligence group head of the Sultan Kudarat Provincial Police Office (SKPPO) said that they launched the raid at around 3 a.m. Tuesday after confirming a tip from a local informant. “We received a tip that the compound was used as a base of a carnapping syndicate,” the official said in a radio interview. At 3 a.m., the team proceeded to Barangay Ilian to arrest the suspects. They did not only collared the trio but also stumbled upon a stockyard of believed to be car-napped motorcycles, parts inter-changed and chassis numbers tampered with said SK-CIDG Chief Garcia. Among the recovered vehicle was the Honda XLR200 of POS4 Sabado. 3 Pcs Muffler, 1 Pc Tank, 4 Pcs Shocks. Sa mga nawalan ng motorsiklo, makipag-ugnayan lamang sa Highway Patrol Group, National Highway, EJC , Montilla, Tacurong City, Sultan Kudarat. (BM Ma. Ester Marin-Catorce) said 95.7 Brigada News FM Koronadal at their facebook page.